Taking up trips to Democratic Republic of Congo will be your number one experiential gorilla tour in Africa since you cannot leave the country minus getting contented of what you will have seen and done throughout your schedule and time frame of the tour. Democratic Republic of Congo is located in Central Africa bordered by Uganda to the east, Congo Brazzaville to the west, Central African Republic to the north and also Rwanda to the west. This makes it accessible to all tourists who enjoy touring to one of the largest countries in Africa. 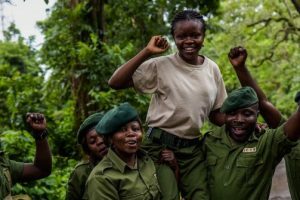 To those who enjoy tracking gorillas, this is the best opportunity for you since this is the only country where you can find both the endangered mountain gorillas and the lowland gorillas within their natural habitat. Within Virunga National Park, you can find these endangered species that live in groups. Tracking them starts as early as 8am by the visitors after a briefing from their guides, this will lead you to the hills where you will pass through ridges and rocky trails, therefore you need to come along with all the trekking gears. This will be a great experience for you since you will stay with these gentle creatures for a full hour enjoying their funny characters at only $400 per person and per trek. Within the same park is the Nyiragongo volcanic hiking, which will cost you $300 per individual, this is the best hiking experience in Africa since you will climb the mountain to experience the active volcanic mountain, this is a two days hike including ascending and descending, this activity needs someone who is physically fit since its high and therefore you need to carry gadgets due to the fact that it’s too cold at the top. While at the top during evening hours, you will see yellowish fumes that will turn the color of the sky as volcanic activities take place within the large crater. Here you will take photos as well as you enjoy the higher altitude. 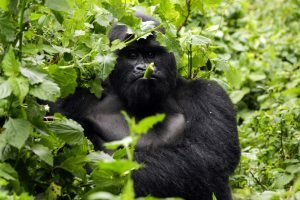 Hoping to do double gorilla trekking, this time around experience the lowland gorillas from Kahuzi Biega national park, this is an interesting national park since besides gorillas you will see other endemic forest fauna and flora that makes this park a must-see destination for the exploratory traveler. Take up cultural tours within Congo and here you will enjoy and appreciate the different cultural diversity Congo has got though French is the country’s national language, you will enjoy the different performances and exhibitions from the local people.